As in most other European cities, soccer is king in Istanbul. But unlike most other cities, Istanbul is home to not one, not two, but three major teams. Galatasaray is currently the top dog, champions of the 2012/13 season and the league’s most internationally accomplished side. Fenerbahçe is the wealthiest and has the biggest stadium. 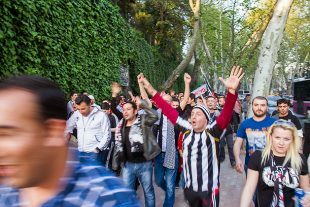 But we chose to throw our support behind Beşiktaş.